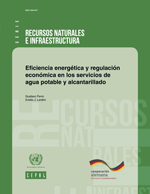 Esta publicación analiza el consumo de energía en el sector de agua potable y alcantarillado y propone políticas regulatorias para mejorar la eficiencia energética de los prestadores de estos servicios en América Latina y el Caribe. 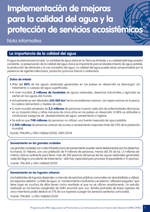 Está dirigido a las agencias de regulación sectorial, así como todas las demás partes interesadas del sector privado y público. 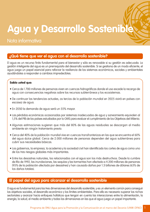 For the purpose of the 2015 International Annual UN-Water Zaragoza Conference and in preparation for World Water Day 2015 focusing on 'Water and Sustainable Development', the UN-Water Decade Programme on Advocacy and Communication (UNW-DPAC) has produced a series of information briefs on different issues and tools. 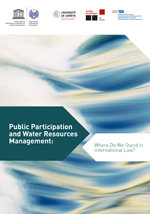 This brief presents the current commitments, challenges and tools for implementation in relation to water resources management. 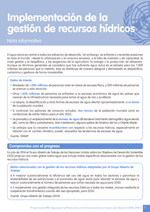 For the purpose of the 2015 International Annual UN-Water Zaragoza Conference and in preparation for World Water Day 2015 focusing on 'Water and Sustainable Development', the UN-Water Decade Programme on Advocacy and Communication (UNW-DPAC) has produced a series of information briefs on different issues and tools. 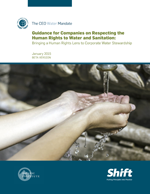 This brief presents the need to manage water risks, as well as the current commitments, challenges and tools for implementation in relation to risk management in water and sanitation. 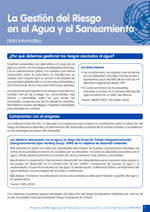 For the purpose of the 2015 International Annual UN-Water Zaragoza Conference and in preparation for World Water Day 2015 focusing on'Water and Sustainable Development', the UN-Water Decade Programme on Advocacy and Communication (UNW-DPAC) has produced a series of information briefs on different issues and tools. This brief presents why water quality matters, as well as the current commitments, challenges and tools for implementation in relation to water quality and protection of ecosystem services. 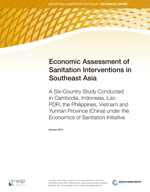 This study presents evidence on the costs and benefits of sanitation improvements in different programmatic and geographical contexts in Southeast Asia. 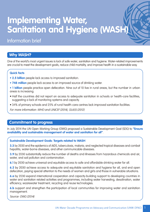 It aims to promote evidence-based decision making to increase the volume, effectiveness, and sustainability of sanitation expenditure in Cambodia, Indonesia, Lao PDR, the Philippines, Vietnam and Yunnan Province (China). This evidence enables explicit comparison of sanitation options on the basis of their relative merits and thus informs both public and private decisions on sanitation investment. 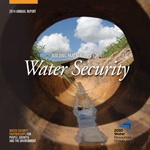 This annual report delivers key insights about the 2030 Water Resources Group (WRG) partner countries progress in the year 2013. It identifies focus areas where projects and programs will soon take shape to ensure a sustained change process. Through its work, the 2030 Water Resources Group is developing replicable models for public private- civil society engagement on water sustainability.